Lately I have been trying extremely hard not to buy every single piece of plaid clothing but it’s so hard ! When fall comes around plaid is the perfect print. 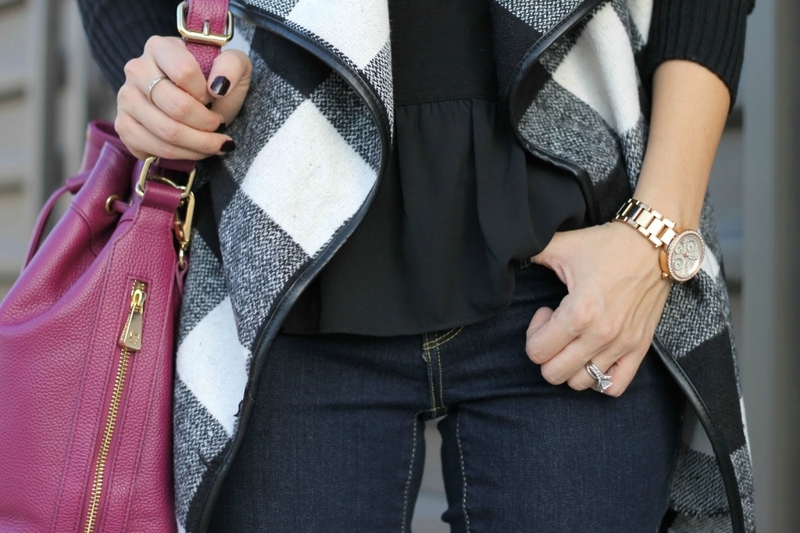 This plaid printed coat is SO snuggly! I recently took it with me on a small family trip up to Prescott last weekend and Im so glad I did. It also comes with this great faux leather belt if you want to tie it around the waist I opted to leave it tied in the back. I normally don’t pick out black colored clothing items I’m not really sure why but I always just end up picking out grey or white. So I was a bit surprised that I also decided to get this ruffled hem tee from the Loft it has a flirty element that I love. But with all the darker colors I had to add a dash of color by adding in the plum/burgundy tones in the glasses, boots and bucket bag. Great outfit! What a unique way to wear plaid, I love it!